Diversity and innate beauty make North San Diego a preferred destination. It ranks 2nd in the United States for best climate with around 10 inches of rain per year and an average day time temperature of 69 degrees Fahrenheit. 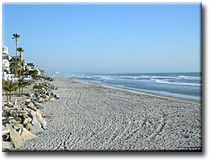 North San Diego features some of the most beautiful beaches. From the densely populated for the social butterfly, to the secluded for a romantic getaway, our beaches will satisfy anyone's desire for fun under the sun. Some features include diving, fishing, surfing, and kayaking. We have listed some of the most popular beaches in North San Diego County. Feel free to browse around and find the beach that fits your getaway plans. Begin by using the links above to select an area. Thanks for visiting, and be sure to recommend our site to others!